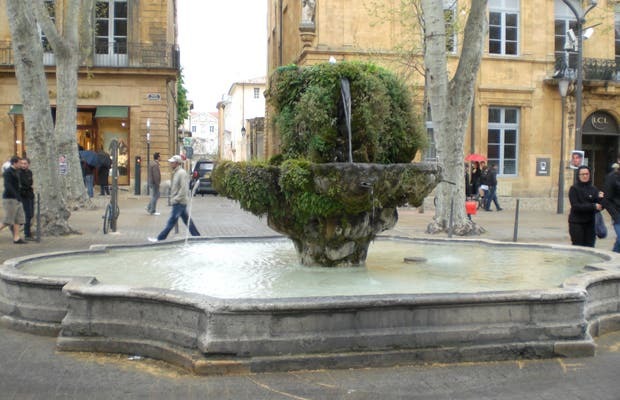 The Fontaine des Neuf-Canons is also on the Cours Mirabeau, the most prestigious avenue of Aix en Provence. This was the old road from Arles to Italy, passing next to the walls of Aix. In the twelfth century there was only a small fountain for cattle that passed on the way to the Alps. Built in 1691, this fountain served as a watering hole for animals, you can see a lower level of the fountain for easy drinking, and the cross-shaped stack allowed numerous animals to drink at the same time. With the extension of the avenue, two jets were cut off, to give way to cars. The fountain of nine jets, is arranged on two batteries.